Update: This was originally one of my first articles on Cacti stats via SNMP, and subsequently I have built an ever growing collection of templates and extension scripts based on the same approaches. Originally this was done as 2-disk templates which where fine for the machines I was working with - my server here is a basic 2-disk setup, so why would I need more. Since that I've worked with all sorts of different disk arrangements and had to fudge things to make useful templates. This update fixes that by bringing things down to two basic templates and switching to indexed SNMP allowing an arbitrary number of disks to be used. As of version 20121214 you can also easily edit the script to index by devices or serial numbers. This follows on from the basics of SNMP I did previously, this article adds a set of SNMP extension scripts, config, and Cacti templates to monitor hard drives. Self Monitoring, Analysis, and Reporting Technology is contained in most hard drives these days. It provides a number of built in tests to evaluate the health of a drive and hopefully predict many failures. Linux has a suite of tools called "smartmontools" which provides a comprehensive set of utilities and a monitoring daemon for checking drives. Configuration of regular testing and monitoring (smartd) is beyond this article and there are plenty of docs around for that already, but what is often useful is to graph key parameters to spot anomalies with parameters which would otherwise go unnoticed. Where DEVICE is the device for the drive (not a partition). Typically this would be something like /dev/sda (first drive), /dev/sdb (second drive) etc. or /dev/hda (first drive), /dev/hdb (second drive), or some combination of both. Note that USB drives do not currently allow SMART data, even though the physical drives inside the boxes are SMART capable. I have no idea why this is the case, and USB drives are the ones I would really like to monitor as they get bashed about more and have poor cooling compared to fixed drives in a system. Like discussed previously, SMART data requires root privilege to access, and snmpd runs as a low privilege user. What I do is have a CRON job that reads this data and stores it in files for snmpd to access via extension scripts. This code in smart-cron simply runs through devices matching /dev/sd? (ie. /dev/sda, /dev/sdb etc.) and dumps their SMART data to a file in /var/local/snmp as described previously. From here extension scripts for snmpd can pick it up without requiring privilege. A special case here is if you have a situation where devices get re-ordered on boot (eg. two controllers which may be detected in different order) and you need to force an fixed ordering. Edit smart-cron and uncomment the SMARTLIST variable, and add in all the device paths that will not change (suggest using /dev/disk/by-id/*). You should go clear out any smart-* files in /var/local/snmp if they have already been created or if you change config to avoid invalid data being left behind. At this point STOP. Wait for the smart-* files to be created in /var/local/snmp. I suspect a lot of problems reported relate to not getting an early part of the chain working fully before moving on. Don't move on until the files exists. SMART parameters are numbered and it made sense to me to exploit the numbering in a universal script instead of having to treat each parameter on it's own. This script takes one argument of the SMART parameter number and outputs the difference (remaining life) between the current value and the threshold for that parameter. It is worth noting that different manufacturers (and even different models and revisions of drives) create these values differently so the value is of little interest on it's own, but unusual fluctuations or downward trends are worth taking note of. For temperatures it is normally necessary to take the raw data which can be done by prefixing the parameter ID with a 'R'. There are many other parameters which you could also monitor and as can be seen, they are easily added by simply referencing the parameter ID and updating templates to match. Note that the config presented here only looks at /dev/sd? devices. If your system has /dev/hd? devices then you will need to modify the scripts accordingly. Once you have added all this restart snmpd. I have generated some basic Cacti Templates for these SMART parameters with one graph for temperatures and another for health parameters. They are easily extended for more parameters. For indexed SNMP, Cacti requires an XML file describing how to map the SNMP data to each drive. As this is a local (unpackaged) version I have done my configuration around putting this file in /usr/local/share/cacti/resource/snmp_queries/ and you will need to alter the templates if you put the file elsewhere. Put the data query XML disk_smart.xml in /usr/local/share/cacti/resource/snmp_queries/ or wherever appropriate for your system. Note that if you change the location then you will also need to update the path to this file in the Cacti Data Query for this template. Simply import the Cacti template cacti_host_template_smart_parameters.xml, and add the data query to the hosts you want to monitor then you should see disks available to monitor and be able to add graphs you want in Cacti. It should just work if your SNMP is working correctly for that device (ensure other SNMP parameters are working for that device). The big improvement as of version 20121214 is that there are a load of new parameters and templates to support for SSDs. While HDDs have mostly the same stuff from model to model and make to make, every SSD manufacturer has their own ideas on what SMART parameters matter, and that's not surprising since the chipsets are also very different. I have provided a generic SSD template with everything that seemed to matter on the SSDs I've encournterded, but if you use this template directly then you will end up with loads of nan values. The idea is that you can duplicate this template and then prune that down for the specific model of SSD you are monitoring. I have done this for OCZ Agility-3 and Samsung 830 series devices, but you are free to do this for whatever model you have. In many cases different manufacturers (and sometimes even models) have different starting values and thresholds for their parameters. As of version 20121214, the smart-generic script assumes that all parameters start at 100 (mostly the case) and scales them to an graph value of zero at the threshold. This is however not always the case. Typically a few parameters on most drives may have a different starting or normal value so there is now a pair of hashes (%SCALEBYFAMILY and %SCALEBYMODEL) which provide custom overrides on a device family or device model basis. Additionally occasionally parameters need ignoring as they are there for informational purposes (via raw values) rather than indicating the drive health and will typically have all zero health values. You can set a scaling of 'U' to hide these values. great work you've done. I had never got my head around populating the SNMP MIB with an external process until now. It always looks easy when it's in front of you! I modified your Perl script and created an SNMP Query XML which will handle any numbers of drives. It uses only two graph templates, one for errors and the other for temperatures. Basically you get 2 graphs per drive. I have a server with 10 drives and did not want to do all the work to add 8 more data sources! And I thought it would be better to make it handle any number of drives. If you're interested I can send you my XML templates. Sorry for the delay getting back to you about your post on my blog. It did take a while to pull all the fragments of info together to get SNMP working neatly. Your approach sounds interesting and I'm sure would help lots of people who have servers with more than 2 disks to monitor. I am happy for you to post a URL on my blog linking to your code & templates, else I am happy to host them off my server. Either way, please make sure you give yourself credit for the extra work you have put into the template and scripts - I would suggest a comment in the code about the enhancements with your name and a URL. Yes, you are quite right about the snmpd.conf line - have updated this. You should only need to change paths if you are putting the file in a different place. Check that the cron job is creating it properly with valid data in it. Hello. I have got this error in Console->Devices->Edit "Data Query Debug Information"
I tried runing it on windows machine but i think this instruction is for linux becaues it doesnt work. Or i have do a mistake somewhere in steps above? These instructions are for Debian or Ubuntu though should work on other Linux distros though may need a few changes. The important thing to note is that using snmpd on the Linux/Unix host we are monitoring and are adding extensions to snmpd to collect the data using smartmontools. With monitoring Windows hosts you would have to extend the SNMP service in a similar way to provide the same data then you may be able to use this template or adapt this template for Windows use. I am not sure if there are any implications to running Cacti on Windows and monitoring an Linux/Unix host with the extensions. That may well be possible without to much trouble. From the error logs you give it looks like Cacti found the data query OK and is trying to check the SNMP where it is failing. My guess is that the host you are trying to monitor is not running the snmpd extensions given here (or Windows equivalent) correctly and that is why it is failing. I hope that is useful to you. No no:), I have got virtual machine which is on debian. Cacti snmp php apache are installed the newest from version stable. Snmp works, cacti draws some graphs on other default settings + template with processes(on windows host). This error log is from creating graph for windows host. My question was is this instruction only for linux hosts/servers or this script can 'catch' windows hosts too? If that's the case then this is not going to work without a whole lot of extra stuff on the Windows host. The way that this monitoring works is that Cacti acts as a SNMP client (no need to install anything extra on the Cacti box/VM), collecting remote data and graphing. The remote host you are monitoring has to be an SNMP server (in the case of Linux running snmpd). Stock SNMP servers (Linux or Windows) will not give the SMART data needed for this. In order to send the SMART data over SNMP, we have to extend the SNMP server on the host we are monitoring with a load of scripts. That is described here for monitoring Linux hosts running snmpd only. It may be possible to extend the Windows SNMP service in a similar way, but that's beyond my Windows knowledge so I can't help with that. Yes, Youre right. Cacti installed and configured on debian virtual machine vmware(created on vsphere 1.0, running on vserver 2.0). I monitor debian vm, some printers, router, 2 servers(SLES[yet snmp cannot connect to him but working on that]+W2K8R2), windows xp hosts. On windows hosts is installed smartmon tools for windows. smartctl -a /dev/sda recognizes the hdd and writes on cmd cli values of smart so it works directly on host. Maybe is it possible to rewrite script to work with smartctl on windows host? The extension scripts are all designed around snmpd on Linux/Unix and will likely need modifying to work with Windows Net-SNMP. That's not something I can help with - I mainly do Linux/Unix work. "Error: XML: Generated with a newer version of Cacti." Earlier i got this one- "Error: XML: Hash version does not exist." Can you please help me matey! That's a very old version of Cacti so it's possible it's simply too old. I might well be a whole lot less work just to upgrade Cacti to a more recent version. Anyways if anybody wants to try importing, the trick is to change the hash numbers the numbers from the 3rd to 6th pos represent the version that the cacti supports min. If you change it manually it will be imported. But whether it will work or not will be dependent on the features used in that template! After these changes were made, it works.... partially! This is where I need your help... again! is the smart-generic not parsing properly? may be the smartmonctl has a different output? may be becos of different version? i have my manual unix thing graphing poweron hrs. So it is there, it is just some text parsing issues right matey? SMART does vary between different drives. Check your snmpd.conf the spec for which parameter airflow is referencing. If there is an "R" in front of the parameter number then it takes the RAW_VALUE column rather than the VALUE column. For temperatures I would normally take the RAW_VALUE which on all my drives is the actual measured temperature, hence airflow is R190. It sounds like you may have a drive that is putting a processed number into the RAW_VALUE field for airflow. Have a look at the cache files generated by the cron job and see what is in those parameters for your drives. On almost all my drives temp and airflow are very close. For "nan" fields, your drives may have fewer and/or different parameters. Again, check the cache file for the drive. Since all the parameters are referenced by their number, you can add more to snmpd.conf, update the .xml with them, and then in Cacti update the Data Template, Graph Template and the Data Query accordingly, then re-add the graphs. thanks for the reply... will look at the cache files tonight and try to get some positive reply mate! had a quick look at the cache file and the data template... why is the airflow min max set to 0-1000 and others 0-100? any idea? could it be the reason why airflow is always 1000? the cache shows identical airflow and temp readings. the other values are pretty high in the cache file.. however the data template is set to expect values between 0-100. could it be why i get NaN? had a quick look at the cache file and the data template... why is the airflow min max set to 0-1000 and others 0-100? any idea? could it be the reason why airflow is always 100? the cache shows identical airflow and temp readings around 25-30.
the other values are pretty high in the cache file.. for eg. Power on hrs=382. Seekerror Rate=21639493. However the data template is set to expect values between 0-100. could it be why i get NaN? Regd. using R as a prefix in snmpd.conf, are you saying R190 gets the RAW_VALUE. Using just 190 gets me the VALUE? I will try few things tonight and get back to you with details. The limits could be responsible for the NaNs but again smart-generic should be picking up the VALUE (remaining life / health) field for that and that is normally in the range 0-100 on my drives. Again different drives may report different numbers. You can also try running smart-generic for the parameters you are getting NaN on and see what happens, but make sure you run it exactly as in snmpd.conf so that it picks up RAW_VALUE or VALUE as snmpd would. Running an snmpwalk may also be useful to know what Cacti is receiving via snmp. Wow! Well spotted! I must have messed that up when I updated this article with the new indexed template. I have updated the article with the correct entries for snmpd.conf (pasted directly from the server I develop the template on). I ran smart-generic for all the parameters needed by graph.. they are right. I highly doubt that there is some typo in the extend thing done in snmpd.conf. shudnt there be any connection between the snmpd.conf and the data template? can u please recheck? How should i read these extends using snmpwalk? can u please show me an example mate! For an Indexed template the entries in snmpd.conf are connected to the Data Sources via the .xml file and the associated Data Query in the template. As some of your graphs are working I think it's likely the .xml and the Data Query are working. Check all the problem parameters are being reported correctly. You may want to pipe the command through "grep smart" to extract only the SMART lines. I can't retvieve any numbers via snmpwalk. When I run "smart-generic 7", it nicely print numbers. But something between snmpd and smart-generic is some problem, I think. All privileges are fine and everything. And when I'm creating graphs in cacti, there's is just millions rows showing zeros. Nothing human-readable. Any advice? When you say you can't retrieve any numbers with snmpwalk, are the OIDs present in the output, just with invalid data, or are the OIDs missing all together? All are missing. I'm using snmpwalk -v2c -c public <ip>, isn't that correct? Then see if the data is being delivered correctly by snmpd and that will tell us if the problem is on the snmpd side or Cacti. Hy. That did help. And, debian stable doesn't have MIB-stuff in stable repository. So for all you Stable-users, you need to download package snmp-mibs-downloader from packages.debian.org and install it to use Extend mibs. now it works, thank you! OK I had fun way too early. snmpwalk now works and shows correct information. 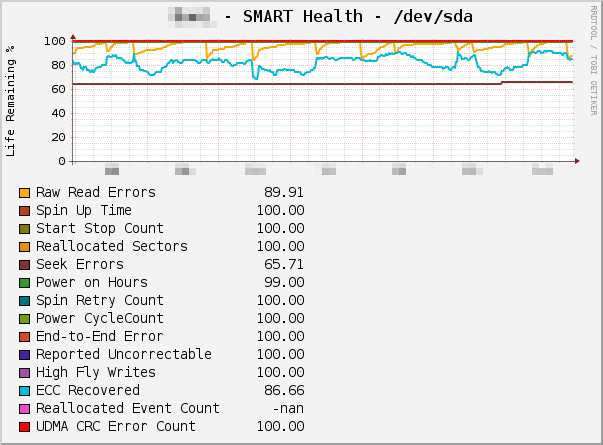 But still, in Cacti, when I click devices, add "Disk SMART Parameters" data query and click Create graphs. In column "Data Query [Disk SMART Parameters]" it just shows 230 rows, mostly numbers between 0-10. But also there are results like "_linkUpDown", "_triggerFail" etc. You have any idea what I'm doing wrong? I just can't figure out. I believe you can add the non-free section into your sources.list in order to install snmp-mibs-downloader. This applies to Ubuntu as well. As for the remaining problems, it sounds as if there is some problem with the index. In the snmpwalk output check the "smartdevices" lines and see that they are all valid. That should be where Cacti picks up the list of devices from. It's also possible it's cached a bad list so also try clicking the green circle to update it. I have to agree, the snmpd side looks all good. Not all drives support all the parameters graphed hence the NA. So long as most parameters are valid it should be good. One thing that may have some effect - are you running the snmpwalk on the cacti server? Check that against the same command on the server you are trying to monitor and see if there are differences. Cacti is version 0.8.8a and downloaded from cacti's site, I didn't use Debian's package. It has no mods/patches, pure install and added only monitor&Settings&thold -plugins. This version is pretty new, have they changed way to get data? But still everything works and it doesn't print all snmpwalk-stuff. Strange, duh, atleast it works. Thank you really much! It does seem a little peculiar. I'm not familiar with all the changes in newer versions and there is a chance that there is something not quite working with the newer version and older templates/queries, or perhaps just it cached some invalid data for some reason. The good thing is it's working. Hi, I'm using regular debian cacti 0.8.7g and it seems I have the same problem as "pm pet". 3) Go to New Graphs and select the relevant host, find the Disk Smart Parameters and click the green circle to refresh it - is it now working? 4) If not then go to System Utilities and click "Rebuild Poller Cache" - repeat 3 and see if it's working. Let me know if at any stage it starts working again when doing that. I'm beginning to wonder if Cacti is doing something unexpected and caching the bad data the first time round. Thanks for the hard work on this. Can't wait to get it workingon my end. The thing that looks suspicious is "Script Query" - this is SNMP and not Script. The real question is how it's managing that as all that should be in the template bundle. That's the thing I would suggest investigating first. Sorry. That selection was from desparation. I have managed to get the templates working. I deleted them and reimported them. Cacti seems to be happy ath the moment. Hoever, my graphs are showing 'nan' but acti has been polling for about 14 hours. In the polling logs I can see there's SNMP values being collected, but the graphs don't reflect the data. I do not see any rows in the mysql poller table. FOrgive my cacti n00bness. As always with diagnostics, look at a stage in the process which will yeild maximum information and divide the problem into clear parts to break down further. I would suggest checking with snmpwalk if valid data is available via SNMP - that neatly cuts between a Cacti and snmpd. This is described in the snmp basics article linked above. I've put your smart data into a test setup and it works perfectly for me. I suspect the problem may relate to a discrepancy in config. This is great stuff, and works flawlessly with direct attached drives. However, I have several systems with 3ware raid cards. Can you suggest how to modify your cacti scripts to make these drives available for graphing? Thanks for the feedback. I don't have any 3ware based systems, but I believe smartctl is capable of interrogating devices behind them so you would need to modify the cronjob to also collect SMART info for all the devices behind the 3ware, and then modify smart-generic to pick those files up as well. Looking at the smartctl man page suggests that the particular way each model needs to be handled is different - that is certainly beyond the scope of what is practical for me to include in this standard version. followed by all OID entries possible. I'm using cacti 0.8.8a and cacti-spine 0.8.7i. Snmpwalk as above works fine. To debug the problem you have to check things at stages along the way that yield useful diagnostic information, hence all the talk in these articles about running snmpwalk and the snmpd scripts manually (ie. from the command line). I suspect these problems relate to not having data coming through before tackling later steps. I've updated the smart-generic script (version 20130420) to give some useful information when it can't read the data files rather than the normal 'U'. Use this new version and take things step by step. Start with running the snmpd-generic script with relevant arguments for the parameter you want to see, then run snmpwalk from the command line on the host you are monitoring, then on the Cacti server, checking the output at each stage. thx for the great script! Use of uninitialized value $param in pattern match (m//) at ./smart-generic line 123. Use of uninitialized value $param in substitution (s///) at ./smart-generic line 125. Use of uninitialized value $param in pattern match (m//) at ./smart-generic line 127. Use of uninitialized value $param in lc at ./smart-generic line 129. In this case $param is the command line parameter passed to the script and tells it what info to return. In the snmpd.conf lines that have to be added the parameter is passed to the script, but based on what you have here it looks extremely likely that the script is not being run with a parameter or something about the version of Perl is discarding the parameter. As the script says "FATAL-need the numeric parameter or 'description' to show"
I would need to see the full output of the snmpwalk relating to SMART (ie. run "snmpwalk -v1 -cmon ip-host NET-SNMP-EXTEND-MIB::nsExtendOutLine | grep smart") to be able to see if it's working as expected within snmpd. i've pasted the output here http://pastbin<DOT>com/NZPc4EyT, hope it can help you. thx! To me that looks like it totally is working. What I suspect is happening though is that rather than using udev, it's got a bunch of static device files which go beyond sdz (ie. sdaa, sdab etc.) and that is confusing sorting and resulting in the U values in the devices output. That's just untidy rather than a real problem. I see no reason why this won't work with Cacti unless it's got a quirk about indexes with U values. I see good data for 7 drives - sda through sdg. To improve things you could hard-code the drives you have: in smart-generic "my @drives = ('sda','sdb'...'sdg');" and remove the other code from opendir to closedir, and in smart-cron "for devfull in /dev/sda /dev/sdb ... /dev/sdg; do"
$ snmpwalk ... 10.0.22.245 NET-SNMP-EXTEND-MIB::nsExtendOutLine. "smartdescriptions"
The "Unkown Object Identifier" is likely the shell processing the quotes - try putting the whole of the OID in single quotes to stop that, or escape (with a backslash) each double quote so it's passed to snmpwalk unaltered. To me everything looks in order from the output of snmpwalk, so I would next verify that the .xml file has not been modified/corrupted in some way that it no longer matches, and that the query matches the path to that file, and stuff like around that area. This looks like it comes down to something around Cacti not being able to match up the output of snmpwalk with the query xml. I can't get it working on Debian Squeeze with 0.8.7g-1+squeeze1. I have the data query associated with a host and it finds the devices and descriptions properly. 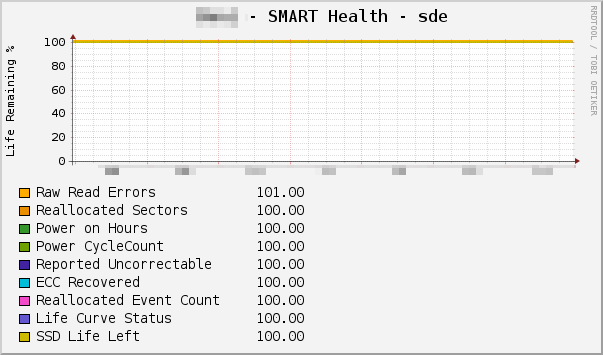 However, when I click 'Create Graphs for this Host', select one of the devices and create graph type 'SMART Temperatures' I end up with graphs associated with some crippled datasources for R190 and R194. Namely in the Custom Data section I get an empty text box for Index Value (normally it's a drop-down select by the way) and next to Output Type ID and Index Type the text 'Data query data sources must be created through New Graphs.' is displayed. I'm puzzled because New Graphs is exactly the way I created the graph. I spend half of the night trying to get this working but I'm out of ideas now. What can possibly be wrong if it works for other people? I'm using SNMP v3 if that's of any relevance. The values are definitely there (at least for R194) when I do snmpwalk across NET-SNMP-EXTEND-MIB::nsExtendOutLine. It seems that Cacti get's confused by multiple "U" in indexes, although it looks fine at the stage of the query and graph creation. I guess if the smart-generic script finds no data for some disks dumped by the cron script, it should not expose them at all. If someone (like me) decides not to monitor some of the drives and modifies the cron script not to dump smartctl output for them, Cacti will fail to create proper data sources in an utterly incomprehensible way. I'm not sure the problem is Cacti in this case. I certainly wouldn't bet on the snmpd extension script behaving as expected without valid input from the cron job. The aim is that the cron job collects (and caches) the info needed, then you choose which disks you monitor (with info from the cached data) within Cacti, but if you start modifying components of the system then other parts may not get their expected inputs and behave unpredictably. Essentially, the whole system has to hang together. What you say about the cron job is correct when you have an low shelf entry level server. If the disks are behind a RAID controller, there are many different ways to access SMART, depending on the controller (various tricks with -d for HP SmartArray, 3ware etc.). For Adaptec controllers it is pretty straighforward - you use /dev/sg[1-9][0-9]+ devices, but only some of them are the real physical disks. The rest represent the logical arrays, the controller itself or the hot-swap chassis. That is why I chose not to dump SMART for those (it ends up with error anyway). And it appears that Cacti is compeletly lost if there are duplicated values ("U"s) in the index fields. You would have to try it for yourself to see what I mean - it fails with the latest version as well. This is something I wish I had figured out how to do. Couple of problems I need to figure out. The first of which is that the smart-generic script doesn't return anything on the command line. The data files are there. So all is good there. The templates are installed. This is on FreeBSD 8.4, if that matters. Well, there's a problem. The files are being saved in $FILES/smart-$drive in the cronjob but accessed as "$FILES-$drive"; Not sure why the dash or truncated name. Once I fixed that, it all works. Here's a diff of what I needed to do to make it work. Hi Paul - the thing I notice is that you have change the storage path and modified the $FILES which included the prefix to the file, and in your case you have removed the prefix part. Then to compensate for the removal of the prefix you have modified the rest of the script to re-add the prefix into the code. The original code was fine, just so long as you don't take out the prefix when you change any paths. Ah, so the last piece of "/var/local/snmp/smart" is a conflation of a file name prefix and a path, not just a path, as I expected? I usually don't mix paths and file names when I create a variable if I expect other people to use something I made so that's where that crept in. I make no assumptions about where something will be used or how other systems are organized. The device naming convention (sd[a-z] or hd[a-z]) are also non-portable. I assume those are linux-isms. Not much use to me. Yup - it is a bit inconsistent and something that is tidier in the development version. Portability isn't my aim - I'm satisfying my needs (primarily Debian), others are welcome to use this as a basis to build on for their needs, but I'm being paid to support everyone's particular preferences. - I don't modify script just download into resources/snmp_queries directly. This looks very much like there may be a problem with the SNMP with Cacti. I think the snmpwalk you did proves that the snmpd-server machine is correctly configured as far as SNMP, but Cacti gets "No SNMP data returned". Does the machine details at the top of the "device" page get properly returned for this machine? 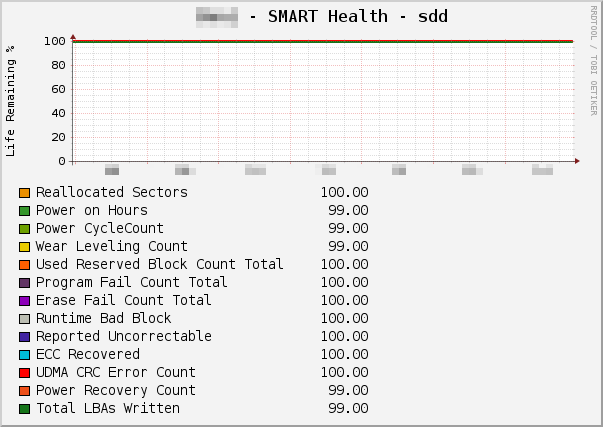 at first device detail are seem correct but uptime is wrong then I restart snmpd-server and query data is correct now. Thank you for useful article. Reading my question led me to the answer: somehow, I forgot to set the community and SNMP version to use for that host. Both comments can be removed/ignored now. Yup - I do that also. Putting your thoughts into words makes me think about them more clearly and that often leads to answers. Didn't see any reason why this shouldn't work with (at least my) 3ware 9690 (SATA Drives, others may differ) sitting in my homeserver (others....) - they're just disks behind the Ctrl reporting their SMART data anyway. The quick'n'dirty addition can be admired below ;); it gave me temperature/health-readings for all 8 disks. RAIDDRV="0 1 2 3 4 5 6 7"
while asking snmp, i get manu U answers.. like these..
That version should be fine. There is a chance of some incompatibility due to the template being exported a long time ago and likely from a different version, so when I get a chance I'll re-export it again when I get some time. Not all drives report all metrics. I have many that don't report 190 so this would be normal. The output suggests something is being read so if there was problems with other metrics that are reported you'd have to trace them through and see when they fail (eg. something missing may be causing files to be empty or a permissions problem). i tried to import the new one, but still "Error: XML parse error.". is there any way to debug the import process ? I think it's worth manually checking the file to ensure there's no corruptions on it's way to Cacti. Beyond that it's probably something to be asking a Cacti forum since I'm no expert on debugging those sorts of things within Cacti. The current code could certainly be adapted to parse a different format like this, but supporting both in the same scripts (especially when I don't have any SAS drives to test against) is going to be an enormous pain. You are welcome to fork the project on GitHub and run a parallel project for this format of data. It helps me and now I able to see the statistics from my HDDs. I've looked that up and it's specific to Compaq/HP (RAID controllers?) which could break things for a lot of other people. I do agree that having an index count is probably the best way of detecting changes with disks where the default uptime method won't detect any hot changes. I'll look at adding a count when I get some time. Actually, having thought about this some more, this is not ideal either way. It's common for some devices to get re-ordered on boot, hence the "Uptime Goes Backwards" method makes most sense for these devices. Device count is likely to ignore re-ordering of devices on boot which is going to mess things up. The only sure way is to do a complete re-validation every time. During setup, th e best way to get things working though is the click the green circle to manually refresh until your setup is working right and you can rely on automatic methods.